My husband and I both use these. iPhone 6 Plus and 7 plus. Never have issues except 1-2 times if my phone had been on vibrate when I went into app there wouldn’t be sound. Turn vibrate off, exit app and go back and it’s perfect. My children love these. 2 and 3 and both with autism. When my son, 2, is having meltdowns sometimes the sound of this book is all that’ll bring him out of it. Works on his fine motor skills too. This app has no sound. I can’t find any way to turn on the sound. I am super bummed as I think my son would have really liked it. I am going to be asking for a refund. If I could give this 6 stars I would! Gorgeous music and narration. Perfect blend of interactiveness without taking over the readability as a primary story. Well done! Cute idea in theory but several things I found annoying, primarily the narrator's voice for one. It's a slow drone that's nowhere near reflecting the energy of the words. I know it's a going to bed book but it's a lifeless narration so I end up reading it. Additionally, some of the interactive features don't work for me. Love Sandra Boynton but not this type of execution. My biggest complaint is that the book is WAY too short for $3. This has only a minute portion of the production value as the Pop Out books which I also own. Tis was a big disappointment. It would be very difficult to rank anything Sandra Boynton below 5 stars, since the material that is enhanced is so great on its own. 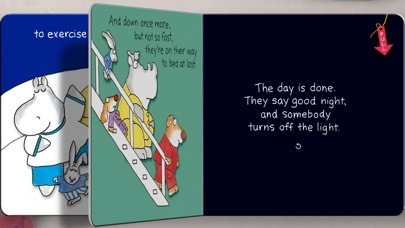 The Going to Bed Book is wonderfully narrarated and Boynton's animations come to life with activities such as dressing for bed, running up the stairs, or steaming up the iPad's screen with hot water. 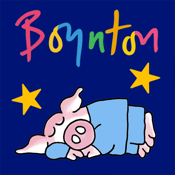 This App is great for any child who enjoys Boynton's books and a fun tool for parents and children to view together. My grandson loves it, but even better, Grandma loves that Billy J. Kramer narrates. To other grandparents: this "old guy" (as the intro describes) is someone you will remember from the sixties with affection, and probably love even more now. What a voice! Please use him for all books! The Sandra boynton interactive books are by far the best offered on iTunes! We have all four they have to offer and we are just waiting for new ones to be created! I love this app but my 11 month old baby loves it even more. She loves interacting with the characters. Awesome app!!! Where is the fun? It's Sandra Boynton... where is the silliness? The music should be in a changing room and the narrator could not be more dull if he tried. My one year old loves this book and I don't even want to show her this app. The book should take up the whole screen. It's amazing someone made Sandra Boynton boring. Boo Boo Boo! Nicely done, just what I would expect from Boynton. I am loving book apps for my children. More of this quality, please! Great adaptation of the original! Our 20 month old daughter was already a huge fan of the board book version of this classic from Sandra Boynton, to say that she "read" it a million times is barely an exaggeration. Although very familiar with the book she had a blast rediscovering her love for it as a result of the interactive nature of this version! It was wonderful watching her explore the pages, tapping on objects and characters, and getting rewarded by whimsical sounds and reactions. Kudos to the developer and to Sandra for their faithful reproduction of the original experience of reading this book, while also adding great interactivity as well! I would love to see more of Sandra's books adapted for the iPad!! My daughter has been enjoying this e-book since she was about three months . As she continues to develop she and I get to explore more and more little surprises within the story. We have all of Sandra Boynton's e-books and a healthy collection of the board books. We can't wait for more to come... Perhaps an e-version of Hippos Go Berserk? 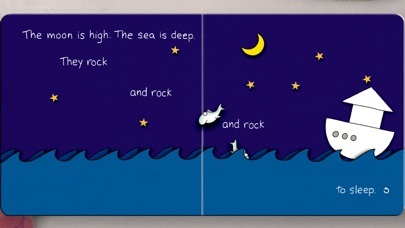 I thought that this was a great app to accompany a nice bedtime story. The only problem I see in the future (or now even, if I want to ask questions while I read) is that even when you say "read by myself" the narrator still reads for you anyway. Kind of frustrating, but not enough to make me regret this purchase. 1 and 3 year old approved! My kids LOVE this book. 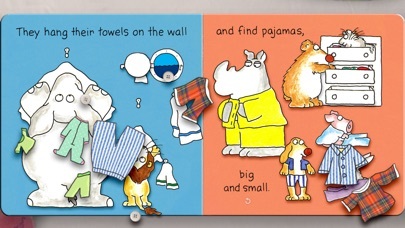 We love the board book version too, but its so cool having the interactive parts too. Don't know what the other guy is complaining about. Seems like a winner to me and causes lots of fights over the iPad. Kid tested, parent approved! I have four children, ages 9 and down and they all love these books. My younger ones enjoying them more frequently. They are a fun interactive book where they can make the animals move and make noise. They can either be read to or read by themselves. This app is fun and youthful just like the books. We have all of them and are anxiously awaiting more. They have entertained my children for hours while driving or at appointments or snuggling together on the couch. This is an excellent re-imagining of the actual book. So interactive and full of fun surprises for kids and adults alike. Now whenever we read the actual book my 18-month-old keeps tapping the pages waiting for something cool to happen. this is an amazing treatment for books. I wish every book for kids was as well done. the technology is stunning, and just plain fun. I show this to everyone, even people without kids because it's a stellar example of how to use the technology! I purchased this app on my iPad. When you turn the first page the screen goes black. I want to be able to use it. Please fix it! I would sooooo love this if only it did not CRASH every darn time. Either fix it or refund me please. I know its a small book but, come on! Really.? It's flawed in so many ways, it a small book but it shouldn't be this small on a iPad, old tech crammed into a new tech world just has the feel of pleather in a luxury organic leather with fine glass polish world. The same company makes the Peter Rabbit series, AAA quality there, clearly this was built by the D - team. Its hard to touch the tiny text, tiny objects, tiny, tiny, tiny... When you see red arrows to tell what you can do on the screen, that should tell you, red flag! Its not intuitive to use, even for a child... Goodnight moon book is done by the same team and i regret buying both of these without reading the reviews first, this book needs to learn from the green eggs and ham series on how a book could be entertaining in this new tech eWorld. My 2 year old son is loving this book and all the interactions.... Especially popping all the bubbles! My 11mo old loves it. Lots of fun Easter eggs to discover. We haven't found anything "too small." We have a 2 year old. He has lots of books on the iPhone. The ones that auto- play, like Dr Suess and Mercer Mayer, are perfect for a toddler who has his little fingers all over the screen. The book continues to play. But this book doesn't work like that. Every time we open this book Boy starts touching the screen and this book stops, squawks, reverses, all in 3 seconds. We have to then take the phone away snd re- start it On EVERY page! We have never gotten thru this annoying, obnoxious book and I'm furious that I paid $4 for this crappy programming. Don't make the same mistake I did. Stay away. My 1 1/2 year old has turned us into a Sandra Boynton household, and this has been one of his favorite books since he was 6 months old. He was thrilled when this book magically appeared on the precious "iPad-uh". The music and voiced narration are beautifully applied, and he has been having a great time exploring the nuances of the various "Easter eggs" throughout the story. My only complaint is that the narration does stop if a finger strays to tap one of the words on the page (which is easy to do when a 1-2 year old is aimlessly poking at the screen to explore what might happen. But we've worked around it, and he continues to figure out what ares of the pages to tap in order to get it to function the way he wants. Thanks for a great app to complement a great story. We love this app. It would be nice if something I spent $5 a pop on would be updated occasionally. Rather frustrating. Still no sound....after three reboots and various settings amendments both in software and hardware. Thanks so much for this update! We commute to my daughter's daycare by subway, and not a morning goes by that she doesn't go through all of the Boynton books on my phone. They are by far her favorite apps, and I was worried that the next iOS update would not support them. Here's hoping the other books come soon! Very good App but the interactivity is not very functional and weak. My 3 year old and I simply adore this interactive book! She never tires of all the fun, as we must read it every night before bedtime. This is a fabulous app...you won't be disappointed"
My 5yr old, my 2yr and I love this App. Sweet, fun, charming, interactive and smart. Great fun. She loves all the interactive features of the book. We loved exploring to figure them all out. 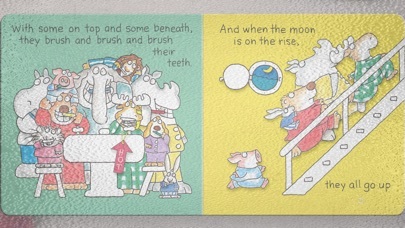 We have had an intermittent issue with the tooth brushing page. After activating the hot water it gets stuck and emits this horrible noise. It's scary for my 15 month old, so not at all good for bedtime. We have been able to remedy the problem by closing the app and waiting a few minutes before re-opening. I have over 20 story apps for my two-year-old and this is one of the best! The interactive and animated illustrations are magical, surprising and entertaining! We have read this story almost every night for the past two weeks. I'm afraid it sets the iPad storybook bar pretty high. The story's simple and soothing. This is a lovely digital version of a sweet board book. The interactivity enhances the experience and the book is well crafted. Even the narration, which is a bit slow and sleepy, is okay because it's--well--a going to bed book. I am completely charmed by tapping the sky to add those lovely, tiny stars. My 2 year old loves this new version of one of his first favorite books. You won't be disappointed. No sound when I first got it, second time there was sound then the app froze and hasn’t worked since. Here's the thing about the Boynton book apps. They are not cheap or buggy. It's fun for the kids to distract themselves and play them over again and again. My two year old can find these and launch them himself. My seven year old still enjoys them even though she is on to chapter books by now. Must have at dinner or doctors office. App will not run. Please help! After 10-15 attempts, I literally have not been able to read this book yet. It crashes every single time I open it. I give it five stars because I know it's going to be awesome as soon as it gets some stability. So how bout it? So happy the makers decided to update! My son LOVES these books! Awesome bedtime book; NO Sound Problems! I just installed this on my iPad Air running IOS 9.3.2, and I have perfect sound. This is a great quick bedtime story: perfect when you hear, "PLEASE? Just ONE more story?!?" Suggestion: If you don't have sound, look at the switch to the right of the volume keys (on iPad). If you see orange, flip it. The default setting for that button is MUTE, but you can change it to lock rotation if you prefer (go to Settings, Use Side Switch For). Some apps ignore it and use the volume settings, but some don't, so if you're not getting sound, that's the first thing you should check. Most people just assume it's a bug in the app. Sorry, it's not! Anyway, it's an easy fix, now that you know about it! I hope everyone who's already complained gets to see this. No child should miss out on this book, it's just too good. Don't pass this up! Don't pass ANY of Sandra Boynton's books up. After seeing some of the bad reviews that have been left here, I just thought I would share my experience. Some have complained that the application is not formatted for the iPad, they might have been confused by the two different versions in the app store, one is just for the iPhone and the other is iPad only, if figuring out the difference between the two is too tricky for some users, then that is more their problem then the developer’s. But getting on to my review, after reading many Sandy Boynton “Boynton on Board” books as a young child, I was glad to finally see that they now had a book for the iPad , with the large screen and rich color that the iPad offers its ideal for kids (and even adults) plus the amazing amount of interactivity in each page, that never ceases to amaze children, who seem to discover something new every time they read the book. In fact I have even gifted this app to one of my friends with children, and both the parent and the child seemed to love the book. While some may not like the voiceovers for the book, my suggestion is to simply turn it off and read it by yourself, in my opinion though I think the voiceover work was perfect for the story, however, everyone is entitled to their own point of view. My overall opinion is that it is a wonderful improvement on the already popular Boynton series of children’s books, and a perfect gift for children of all ages. My Daughter loves this book! The app makes it even better, making the book so much fun! It's crashing after the first page. Please fix the problem. I have no idea if this is a good book or not. The program crashes after page one. Well executed! The music is so soothing and, contrary to some of the other reviews, the narrator's voice is perfect. The graphics are lovely and the interactive features work wonderfully. A wonderful tribute to a childhood favorite.